This blog is for the New or Old PowerPc Mac user, to kill time off your searches for what ever it is you are looking for, with PowerPc becoming older and older, as you read this, as are the search results and interest. I personally got my first powerpc mac - Powerbook G4 1.6ghz 1gb ram(a top of the line powerbook luckily ^_^) around Febuary 2013 , as a secondary computer. I knew what I was getting into, and was very interested in the PowerPc and since it is a part of computer history I thought it essential to experience. With this blog I will do my best to supply you with information in the quickest and easiest to understand way possible ( also optimizing this blog for PowerPc should be fun ). 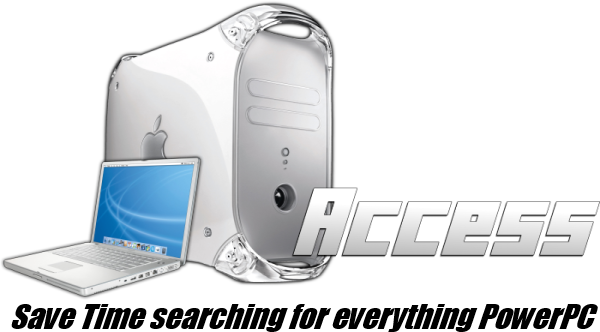 It is hard to find working software for the powerpc macs now. I figure why not share what worked for me , to save other peoples time. I do not support piracy, but I might post links to some websites were that is available. (Since it somewhat imposable to even legally find old software.